The Legend of Zelda: OoT is one of the greatest Nintendo 64 games released. The anticipation for this games release was the most ever seen for its time and when it was released it was the best selling game of 1998. The game surrounds our hero Link, a young Kokirian boy that has not yet recieved a fairy where as his friends in the Kokori forest have. One day a fairy called Navi is sent by the Great Deku Tree to become the young boys guardian and bring him to the Deku Tree. After aquiring a sword and shield Link greets the Deku tree and after going inside him and killing the evil spirit the Deku Tree tells Link about an evil Gerudo man, named Ganondorf, that is trying to get his hands on the triforce, a relic left by the gods when they created the world. If one as evil as were to get his hands on the triforce, the world would become ruin, so Link sets out to find 3 jewels to open the door of time, the door to the scared realm, where the triforce resides. After doing so, with some events occuring, Link opens the door of time and picks up the legendary Master Sword, where Link grows to the age of 17, meaning that 7 years had passed in Hyrule. Link then travels back and forwards between time to stop Ganondorf and save the land of Hyrule. 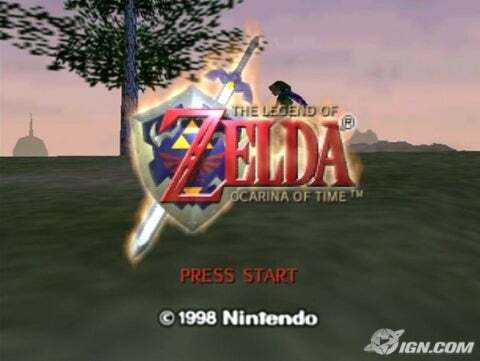 I personally loved this game, it was the first and best N64 game i got and i never looked back afterwards. The games graphics and story were stunning and the game was fun of unexpected suprises whcih added to the delight. Even to todays standards, this game is considered one of the best ever released games of all time. OoT is a role-playing action RPG game with puzzle elements mixed in nicely. It uses the b button for sword attacks, A is the action icon telling you when to pull, climb and any other action, and the C buttons are used for any additional items as well as the Up+C for hints from Navi. It has a "Z Targeting" system where in pressing z you can lock onto enemies and look at points of interest. There are treasure chests and doors with locks that you must find the keys as well as puzzles that will make you use your brain to think of solutions, they are not all brain teasers, but they add another element of fun to this exellent game. Overall View: This is an exellent game and there are few who dislike it, to crazy characters to great landscapes and not to mention the great story line. It should also be mentioned that OoT is one of the first games available on the Wii virtual console downloads.